Today I am going to share a card with you that I made for the CAS-ual Friday challenge here. Normally I don't participate in challenges because I can never get my act together for the deadline. But today when I saw the challenge - a book inspired black, white, and red card - I knew what I was going to do. One of my all time favorite books is Gone With the Wind. I just love it. So, I thought I would take a literal interpretation of the challenge and use a couple quotes straight from the book. 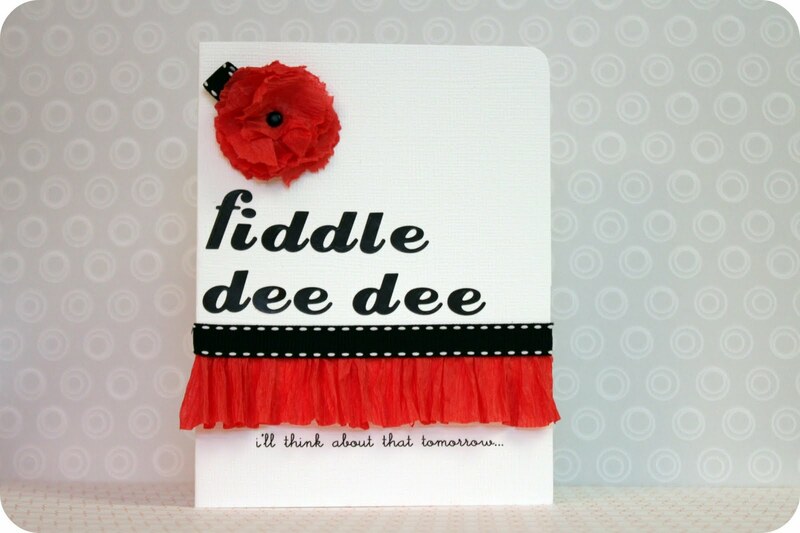 This card would be perfect for someone having a bad day. Sometimes you just need to put off your worry for another day. Or is that just me? 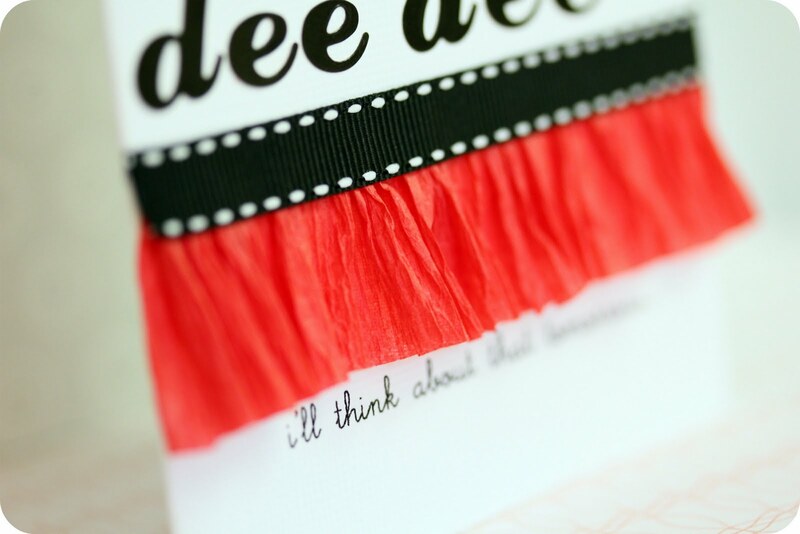 Since I know you all haven't had enough of my card tutorials from card month (wink, wink) I thought I would throw in a quick little tip here on how to create this ruffly bit. 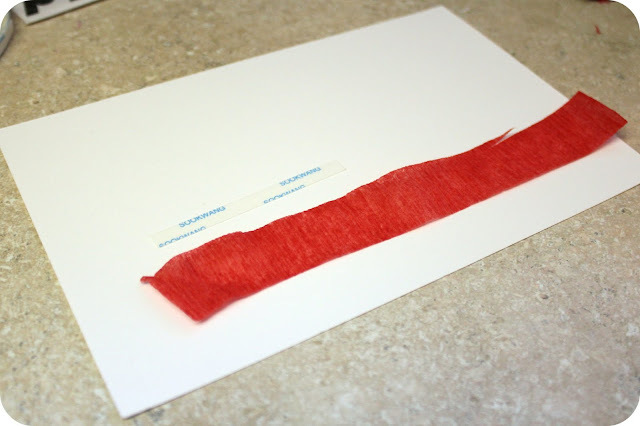 Start with a line of adhesive tape (a really, really strong kind) and a strip of crepe paper streamer. 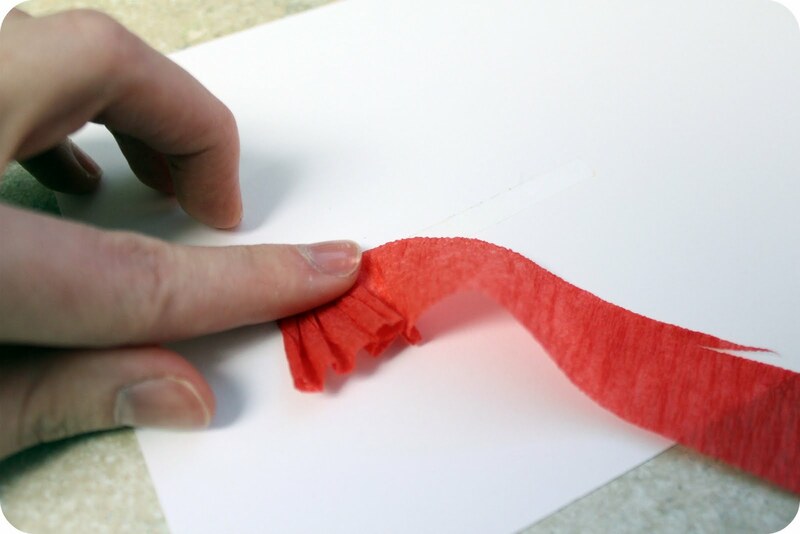 Ruffle it with your fingers by scrunching it together. And smash it down onto the adhesive. 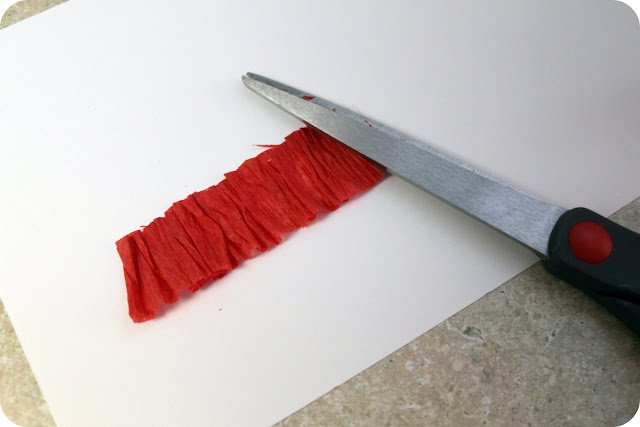 You can then trim it if you need to make it even at the bottom. 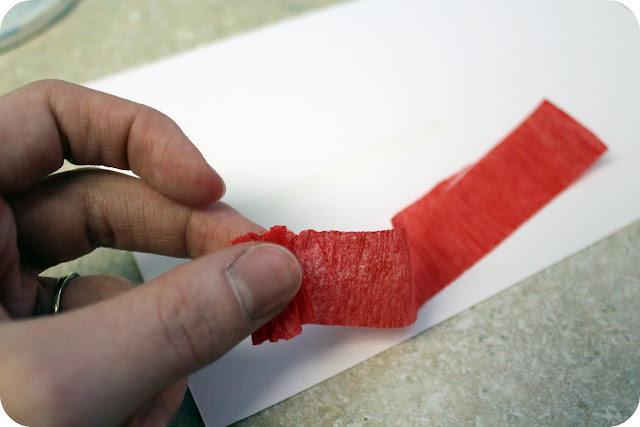 Add another line of adhesive tape right above the ruffle and adhere a strip of ribbon. 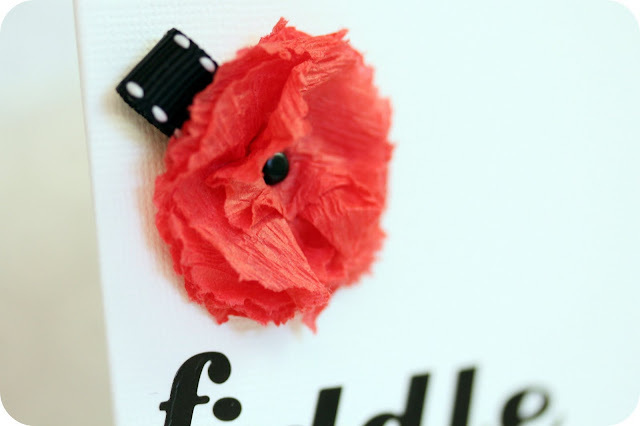 The flower is just punched circles of crepe paper, scrunched up a bit with a brad in the middle holding it all together. The letters are from a sheet of stickers I got at Joann's. The small text from the bottom is printed on the card. Before I cute my 8.5 x 11 sheet of cardstock to make into 2 cards, I printed the quote (using Word). I know I talk a lot about my cards being easy and simple and maybe you don't believe me. This card took me less than 10 minutes to make. Simple, clean, and really fun. A perfect Friday afternoon craft. Fantastic take on this fun challenge! Love your beautiful CAS card!! LOVE this!! One of my all time favorite books and such a splendid take on it!! 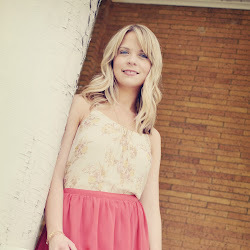 Just gotta love Scarlett :) Glad you played along with us at CAS-ual Fridays! A great challenge and a great card! I am now thinking of my favourite books and quotes or words I can use from them to make a card. Thanks for the inspiration! OH...MY...WORD! This is fabulous! I LOVE LOVE LOVE it! Gone With the Wind is one of my favorites, and so this is just great! Super cute - love your take on the challenge! Gone with the Wind is one of my all time fave books!! 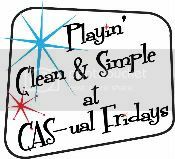 Thanks so much for playing with us at CAS-ual Fridays! What a great card, fantastic work!